Home / Intro / What kind of bartender are you? What kind of bartender are you? Are you an order taker… a persuader… the life of the party… an entertainer… a psychologist… a matchmaker… a listener… a conversation starter… a magician… Flair bartender… Mixologist… ambassador… trainer… rookie… jedi? At some point I believe we have been a little bit of everything to many different people in many different circumstances. A good bartender can take orders and serve cocktails in a timely manner… a great bartender can do the same but realize what kind of bartender demands what kind of service for that guest at that particular time. Think about it… your guests have different needs at different times they come in to see you. Chances are you adapt to those needs for that instance and become the bartender they want at that time and not the kind you think you have to be. So I ask you, our loyal Flairbar.com readers… what knowledge are you going share this month? We start off with “Be the Bartender Your Guests Want at that Time…” by Rob Husted. An in depth article building on what we just talked about above… Hmmmm what a coincidence, Lol. All on our ‘Articles‘ page. What are your thoughts on the subject? Do you have an article you would like to share…? Message us on our Flairbar.com Facebook page and lets discuss. Then we move on to Las Vegas for the “LVFA Margaritaville World Flair Bartending Championship” with Sir Raminad Ong and his coverage of this awesome event on our ‘Comp Reviews‘ page. Jugglers, Cocktails and Flair bartenders… Oh my! Next we have one of the organizers of the event Danilo Oribe teaching us a quick bottle and two tin Working Flair sequence on our ‘Masterclass‘ page for you to use behind the bar or at your next competition. All on our ‘Masterclass‘ page. 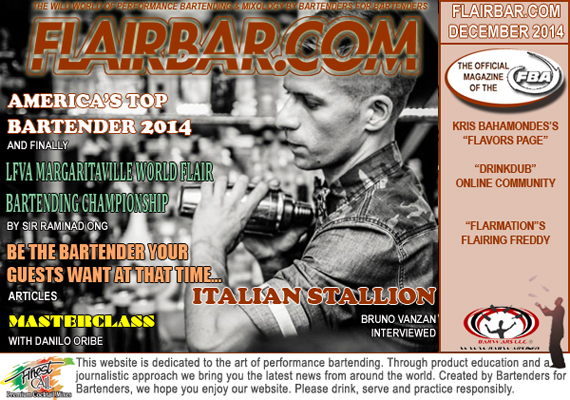 Then we head over to Italy with Bruno Vanzan and this month’s cover of Flairbar.com and interview with “Italian Stallion” where you can get to know more about Bruno and see how he is making a living on his skills and million dollar smile. All of that and a lot more all on our ‘Interviews‘ page. Then we head over to America’s Top Bartender with GQ Magazine and Bombay Sapphire. Watch the edited series unfold in these well produced video segments from this amazing event all on our ‘And Finally‘ page. For more inspiration with your cocktail game… Check out “December Delights” from Kris Bahamondes to help you build upon your already ever growing cocktail list, all on our ‘Flavors‘ page. Next check up on one of our most animated characters here at Flairbar.com “Flairing Freddy” on our ‘Flairmation‘ page. In this issue we catch up with Freddy working during the holidays. All of that plus our regular features, more ‘Barware‘, more pages, and more Flair than you can shake the cover of GQ Magazine at.